A Taste of the Southeast - Click Here for the Best Deal Online! Blue Monkey Coconut Water is a new brand of coconut water that is taking America by storm! If you’ve been to Whole Foods recently, you’ve probably seen Blue Monkey somewhere in the health drinks section. But we have good news for you – you can get all of the benefits of the Blue Monkey without the cost by buying online through our price comparison services! But first, read up about Blue Monkey and why this line is so incredible! 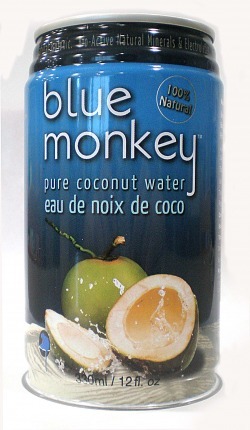 The Blue Monkey Coconut Collection came out recently — in 2010 — due to people wanting REAL coconut water, not coconut water from concentrate. If you’ve browsed through this site, you’ll know that we are all about true coconut water, and we fully believe that Zico dropped the ball when they “went corporate” and started putting out low-quality, concentrate-based products in nasty plastic containers. Blue Monkey wisely jumped on this market weakness, and now has some amazing juice and coconut blends to boot! Blue Monkey started in the premium glacier water market, so bottling the good stuff in quality containers is nothing new to them. Their coconut collection is awesome – you have options to drink fresh coconut water both with or without the pulp, as well as a coconut powder that you can mix with water and bring on the road – AWESOME idea – one of those ideas you wish you would have come up with first! Blue Monkey puts the customer first, and takes no prisoners when it comes to quality. This is where Blue Monkey Coconut Water sets itself apart. When we first launched this site in late 2010, we loved the Brazilian coconut waters that you get from the “big 3” brands. That was, until, we had Thai coconut water! Holy crap! This stuff is simply on another level, and is far sweeter! Blue Monkey gets theirs from all over Southeast Asia – mainly the Philippines, Indonesia and Thailand (yes!). But just because it’s from the other side of the world doesn’t mean that they compromise on quality. Blue Monkey’s screening process is extremely selective when they are looking at the young green coconuts that produce this water. They’re also for ethical working conditions and clean treatment of the environment – otherwise they wouldn’t be in Whole Foods! Flat out, Blue Monkey is legit. We love the Thai coconuts used for their water. Is it the cheapest stuff around? No – but this is what you want when you’re going for quality. Users love this change-up from the plain ol South American / Brazilian coconut waters, as we do too. It’s a bit mroe to ship over here, and a bit harder to find the quality they demand, and that’s why the price is higher. But it’s worth it to us coconut water aficionados looking to take things to the next level! This is a no-sugar-added product. What you get is what you get – 100%, pure unadulterated Southeast Asian coconut water. The coconut water with pulp has 19g of carbs, 10 coming from sugar. The powder mix is about the same, but at 18 carbs and 10g sugar. This is par for the course with natural coconut water. You’ll also get 290mg of potassium in the 11.2oz can, as well as 42mg of sodium. These are great to have post workout or if you’re hungover! There’s also a 17.6oz can you can drink from too if you have a bigger appetite. Now let’s talk about the powder. Basically, it’s spray dried, dehydrated coconut water, with a dash of natural cane sugar put back in to replace what’s lost when they’re doing the dehydration. Now you can add it to your water bottles and travel with it and you’ll have electrolytes on the go! We can’t stop stressing what a great idea this is! Well, if you like getting ripped off, go to Whole Foods and have yourself a nice day. Otherwise, use our price comparison widget below to buy it from the cheapest store online – we keep prices up to date and are happy to add any other online stores to keep prices low! You get free shipping and the coconut water cans won’t go bad either! Plus, you most likely won’t have to pay sales tax! Overall, we’re huge believers in this company, and are glad there’s a company that’s attacking this market with natural coconut water from Southeast Asia and bringing it nationwide to America. Cheers to Blue Monkey!